I’m absolutely not a human being until I have my morning latte. Call me a coffee addict, call me a grump, whatever you call me, I don’t really care because I just want my morning latte! If no foaming equipment is available, then regular coffee will do, just as long as I have some creamy moo-free milk. Yeah maybe I have to work on not being a coffee addict… but I’ll do that later…maybe. 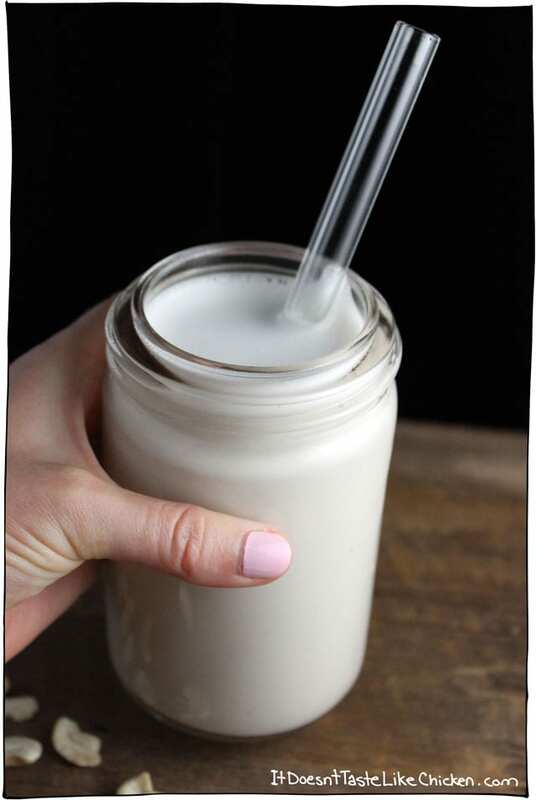 I love making homemade nut milk but it can be so annoying and messy to strain out the nut pulp. 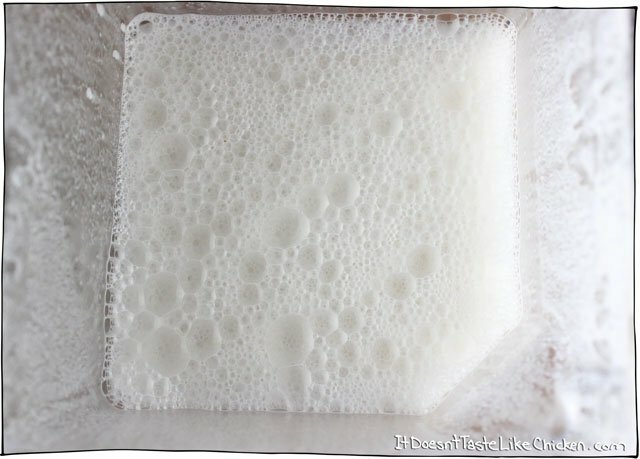 Then you are left with all of this pulp that seems wasteful if you don’t use it for something but can be difficult to use up. Introducing Strain-Free Cashew Milk! No straining means no mess, means no waste! On top of that, all of the fiber and nutrients remain in the milk making this extra healthy. It even foams well for my morning latte! It’s so creamy and luxurious my mom said it made her coffee taste like dessert. Mmmmm dessert coffee…. drool. Before we get to making cashew creaminess: Time to announce the winners of the Plant-Powered Families Cookbook by Dreena Burton. The winners are (drumroll please) Leeba E. and Jordyn M. Congratulations! I have contacted you both by email and will be sending out your cookbooks to you shortly. 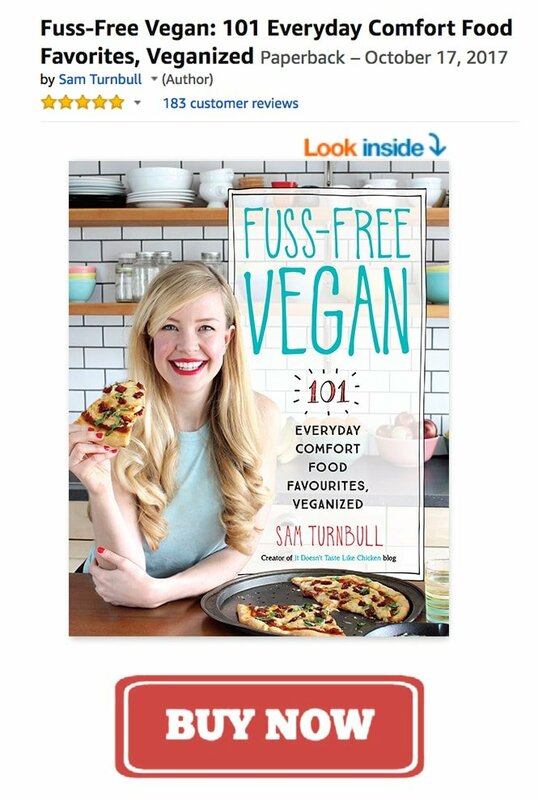 If you didn’t win and now want to buy Plant-Powered Families Cookbook for your kitchen, you can pick up your copy from Amazon by clicking here, or first check out my review here. More shopping? I just went to Toronto’s Vegetarian Food Festival, where I ate EVERYTHING I could get my hands on. 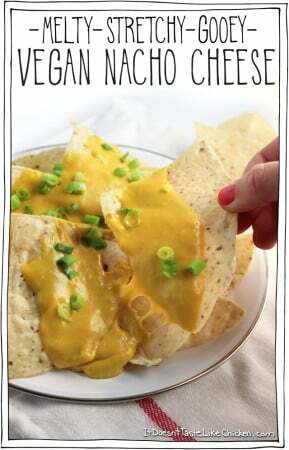 Oh my goodness, so much vegan deliciousness. I was sporting a shirt with my own logo on it (geek alert), and I got so many compliments on it! Many from people who didn’t even know my site. So I decided to put it up for sale. 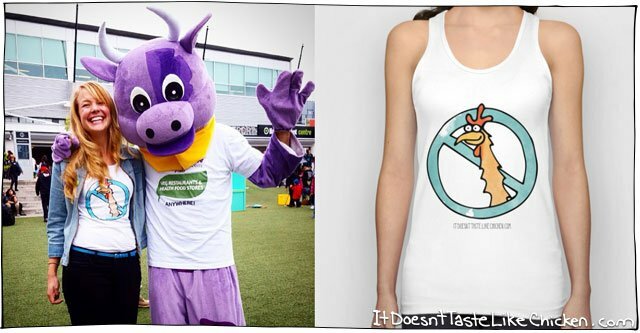 If you want your very own It Doesn’t Taste Like Chicken tank (it also comes in a t-shirt, tote, and a whole whack of colours), you can pick one up here. 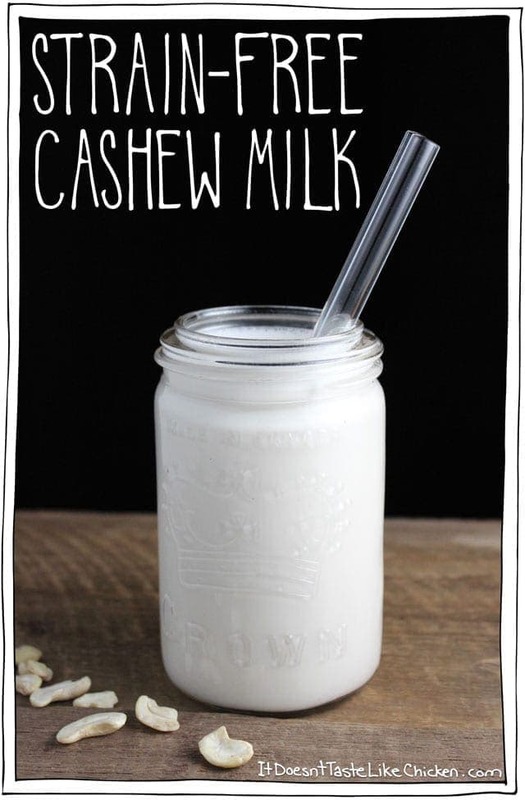 To make Strain-Free Cashew Milk: we have to get those cashews all nice and tender. Put them in a bowl, cover them with water, and soak them for 3 to 8 hours, OR you can put them in a pot, cover them with water and boil them for about 10 minutes until they are tender. Both ways work well, but for some reason, I find the soaking method results in a slightly creamier milk, so if you are not in a rush, try that one. Next, drain and rinse the cashews and add them to your blender with just 1 cup of fresh water. Blend, blend, blend! The cashews will turn into a thick cashew cream. I find it is easiest to make this cashew cream first as you can get rid of all of the lumps and cashew bits. Really make sure everything is blended well and there is no pulp left. Once you’re convinced it is 100% smooth, add the remaining 3 cups of water, the vanilla extract and sweetener if using, and blend to combine. Store in an airtight container in the fridge and shake or stir well before serving. It will keep for about a week if you don’t guzzle it first. 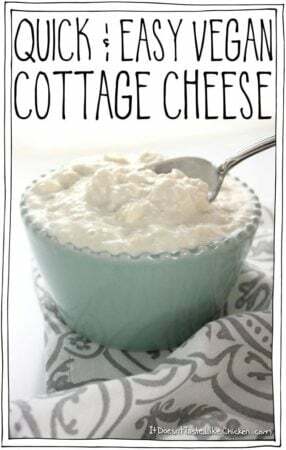 This is my most favourite milk recipe! No straining means no mess, means no waste! On top of that, all of the fiber and nutrients remain in the milk making this extra healthy. It even foams well for my morning latte! You can choose to boil or soak the cashews. 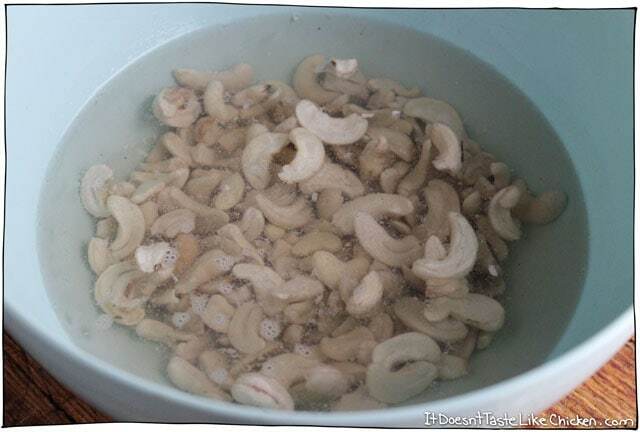 To soak the cashews: Put the cashews in a bowl, and cover them with water. Let soak for 3-8 hours. 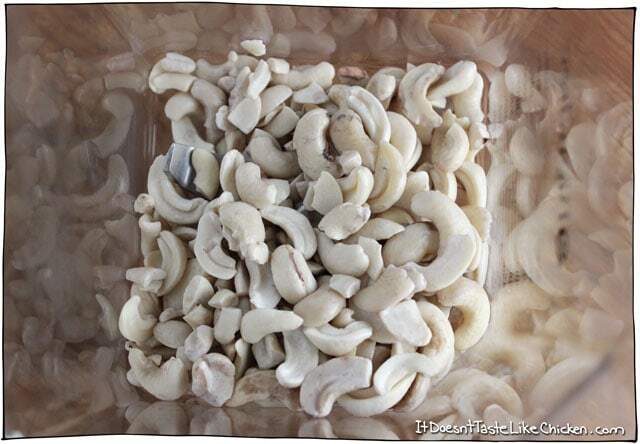 To boil the cashews: Cover the cashews with water in a small saucepan. Bring to a boil, and boil for about 10 minutes until the cashews are very tender. When you are ready to make your milk, drain and rinse the cashews, then add them to your blender. Add only 1 cup of water and blend. You want to start with just 1 cup as I find that it blends smoother and doesn’t leave any cashew bits un-blended. Blend until completely smooth and creamy. Now add the remaining 3 cups of water, vanilla extract, and sweetener if using, and blend to incorporate. Store in an airtight container in the fridge, and shake or stir well every time before using. Thank you for this recipe! It was incredibly easy, and insanely delicious. A little gritty but that’s completely user error. I don’t like running my blender for long periods of time in an apartment building. So happy you enjoyed it, Meghan! Can i use roasted cashews? Can I use a food processor? I’m worried my blender isn’t the best. Thanks! Food processors usually work best with more solid ingredients and blenders are for more liquid. I don’t think a food processor would work well here, unfortunately. Hi Prex, so happy you enjoy it! Yes, sugar would work fine as well, just make sure it gets dissolved so it doesn’t settle at the bottom. Enjoy! Hi Sam, thanks for the great recipe! I’ve been looking for a good comercially available dairy-free creamer for my coffee but couldn’t find one so gave this a go last week. It comes the closest to any other I tried with respect to colour and creamyness. However, despite pre-soaking the nuts well and really blending them thoroughly with a high-powered blender there’s still a “grainy” structure to the milk. In fact if I add it to my coffee and leave it standing for a couple of minutes, you can see a lighter layer forming at the bottom containing those tiny cashew grains/parts. Again, when blended it was lump-free but can’t seem to get rid of these tiny “grains”. Any tips on how to get rid of this without straining? In any other dish (e.g. as basis for dessert or vegan bechamel etc) I wouldn’t mind the grainy structure but in my coffee it does bother me a bit. 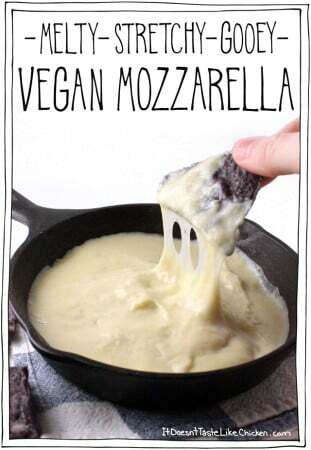 Also, I’d like to try this with almonds as well. In case I do need to strain the mixture after blending, what would you recommend using? Thanks in advance, have a great day! So happy you are enjoying it! Blanched almonds might work, but my guess is they will still need to be strained. The graininess comes from the water and cashews separating, and I’m afraid there isn’t much that can be done about that. Sorry I can’t be more helpful! 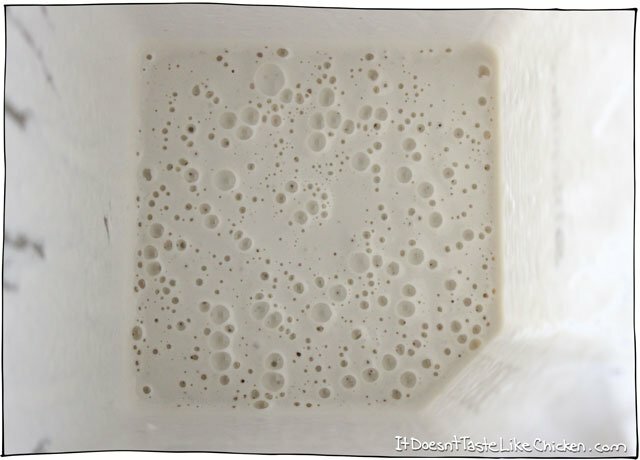 I know it’s been over a year, but in case there are others like me, I wanted to offer a reply to this question regarding what to use to strain nut milks. You can buy nut milk bags on amazon. They work amazingly well. I wash them with my kitchen towels. You could also use a tea cloth, several layers of cheese cloth or a flour sack. Great recipe! Made it today, I have always read about making these milks, but never thought it could be this easy. I sweetened mine with a few dates and some honey. Taste great and I’ll definitely make this again. How long do you think this milk will stay good for? I would say for about a week in the fridge. This is excellent Sam! I recently realized that I have trouble with gellan gum. I switched to a different vegan creamer because my almond one had it and I had massive stomach problems with it. I started having those problems again and looked at the ingredients and the new creamer changed their formula to include gellan gum! Anyway, I’ve been making cashew creamer but just made this milk today because every non-dairy milk seems to have gellan gum now too. It’s delicious. I like the thicker creamer for my coffee, but I’m lazy and will likely just use the milk so I can make it once and use for oatmeal and other things too. Haha! I go through cashews at a stupid rate these days. I went for years without buying cashews and now panic if I’m running low. 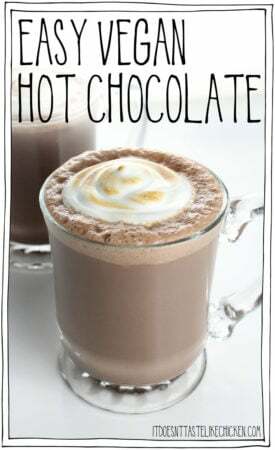 I just made this with 1/2 cup less milk and used it in Thai Iced Tea!!! AMAZING!!! Your recipes are so good and I am loving cooking my way through your blog! I luv the shirts!! I also luv your recipes. Can raw cashews be bought in any grocery store? Does that work with Kitchen Aid mixers as well? When I got mine, I bought it for the looks. I was far away from trying anything vegan for what you need a power mixer. Usually I do not get nuts or anything lump-free. Any hints or suggestions? Hi Lily, do you mean a Kitchen Aid Blender like this one or a Kitchen Aid Mixer like this one? If it’s the blender than it should work fine as well as you make sure the cashews are very tender first, if it’s the mixer, it won’t work as that is more for making doughs and batters. Hope that helps! Do you use a Vitamix? Do you think a less powerful blender would work if the cashews have been soaked? I use a Blendtec (it’s probably my most favourite kitchen tool). 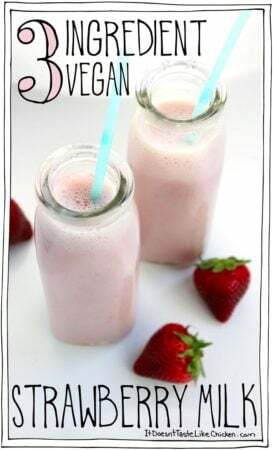 I do think a regular blender will work fine, just make sure the cashews are very tender before blending, and make sure that the cream is blended completely smooth before adding the remaining water and flavourings. Enjoy! Yum!! I like making my own nut milk every now and then but hate that the pulp goes to waste, but this is great! Thanks! lasagna,etc. the extra cooking time softens them up even further. you’d have to use it within a few days probably. i used it the next day. not sure if it would freeze, but i don’t see why it wouldn’t. cashews are expensive so i hate to waste it if i can help it. same with almond milk pulp. google almond milk pulp recipes. i used it for a cauliflower/cheese with peas recipe. it was amazing.